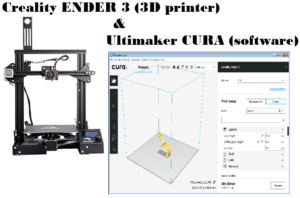 From the new page ADD a new printer, in our case ENDER 3, and next select: MACHINE SETTINGS. 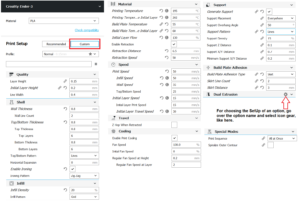 Configure the page as show below. It’s also necessary configure the Start-G and the End-G code. Now is necessary choose the filament that you need to use, see below. Now we must configure the options regarding the QUALITY, the SHELL, etc. Below there is a global overview of all configurations. Don’t worry we will explain step by step all in this tutorial. 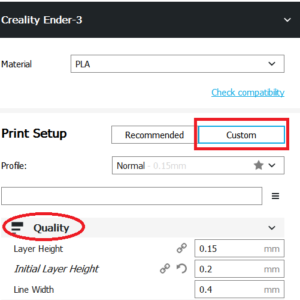 LAYER HEIGHT for a standard 3D print select 0,15 mm, if you need more precision choose 0,1 mm or if you are hurry choose 0,2 mm. 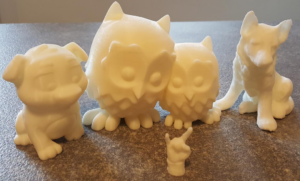 The max resolution for CURA 3 is 0,1 mm. INITIAL LAYER HEIGHT is the first layer drawing by the 3D printer, we suggest to choose 0,2 mm for leave on the printer area, a good thickness of material (PLA in our case). LINE WIDTH is the diameter of the extruder, in CURA 3 is 0,4 mm. WALL THICKNESS is the thickness of the wall, we suggest 0,8 mm but if you need a more robust construction increase this value. ATTENTION: in our case we had configure the LINE WIDTH at 0,4 mm (is the diameter of the CURA 3 nozzle) so the WALL THICKNESS must be an multiple of LINE WIDTH, 0,8 or 0,12 or 0,16 , etc. TOP/BOTTOM THICKNESS, are the thickness that must be a multiple of the value set in the LAYER HEIGHT. IRONING, we use this because is a good solution for hide or better connect two successive lines. 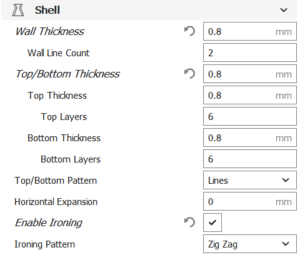 INFILL DENSITY, it’s a percentage that you choose based on how dense you want your print. 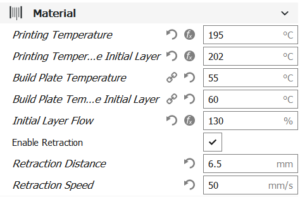 The parameters below, regarding the temperature, depends of the material that you use. 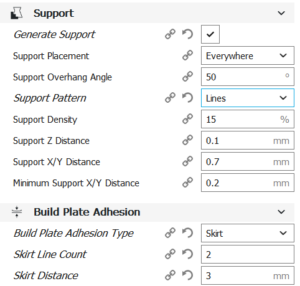 The configuration below are for PLA but depend also of the PLA that you use. We use the CCTREE PLA 3D Stampante a Filamento – BIANCO, if you use another PLA see the data sheet of your PLA. We consider very important enable the RETRACTION DISTANCE and RETRACTION SPEED because thanks to this parameter the printer retract the PLA during a movement from one print area to another one. 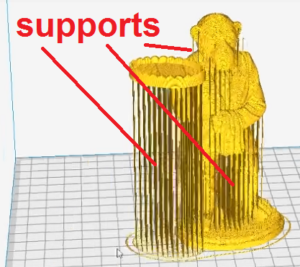 Thanks to this option we avoid that printer release a filaments from one part to anoter one. Speed are very important because conditioning the final result of our printing. How to set this parameters ? Second try to print the same object with a different speeds until you find a good soluction. 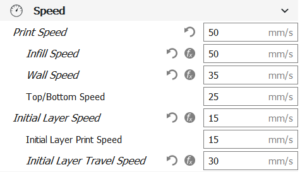 In any case remember the low speed means optimum quality of print. it’s very important use a low speed for first level (INITIAL LAYER SPEED and INITIAL LAYER PRINT SPEED, this give to PLA the time to join well to the plate. In this box is important that INITIAL FAN SPEED is set to 0. This is because at the beginning we want it to be as hot as possible to make good adhesion of the PLA to the plate. It’s important enable support if you have something that is suspended in the air. 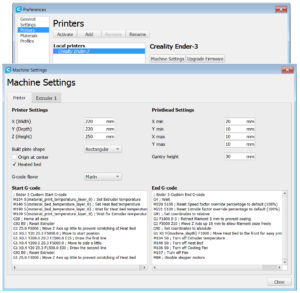 If you has more than one object to print, by this option you have the possibility to print all the objects in parallel – ALL AT ONCE (suggested) or one by one. 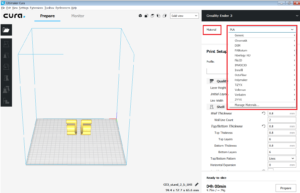 Below there are some 3D printing examples using the setup explain above.